What is warabi and yokan? Warabi is a traditional Japanese confection made from starch and roasted soybean flour. Yokan is a sweet made from red bean. June 28, Diary entry by Gihachi, translated from Japanese. At 7 in the evening receive telegram saying my beloved brother in Salt Lake City has died. It happened on the 25th at 3:30, heart failure, he was 64. The funeral will be 2pm on the 29th. My brother was my favorite, who I most respected. I had no idea he had been ill or that his heart was weak. Even after I read the words in the telegram I couldn’t believe it and thinking I had misread it, read it over a second and third time, but it still says “Ichiro pass away.” But even though my brother is dead and this telegram has arrived, because I am a prisoner there is nothing I can do. This time, now that my brother has left me, I feel deep sadness and grief, and even though I say I won’t cry, every time someone offers their condolences I cried a man’s tears. Unlike what would usually happen, even though this is the death of a brother with whom I share blood, I cannot send money or offer words of comfort to family and I truly resent this. There are many tears even though I tried to steel myself so I wouldn’t grieve so much. 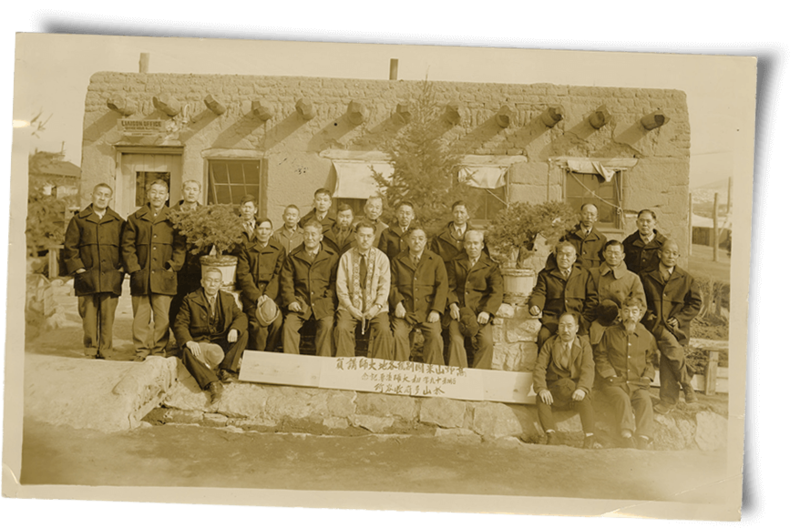 July 2, 1942, Postcard from Gihachi to Tsugio, written in English. I have received your letter of 6-26 which is expressing your sorrow for brother’s death. I am trying hold myself not to grieve so much for the case because it can’t help any more now. July 8, 1942, Letter from Gihachi to Tsugio, written in English. I am sorry but can’t write the name of men were in charge of the services (tsuitokai) decorated the barrack for the services with my bed sheets & table cloth you gave me, and using my tin cup for candle holder. I & a LA man picked handful wild flowers & big grown warabi. Fortunately I had an orange and a can of yokan which sister gave me few days ago decorated the church table as my offering. No people gave flowers as we can’t buy flowers. I had $1.50 coupon and two of my friends had some so I bought 72 soda waters and treated those people came to the services. It was very successful services as to the condition. The spirit of my brother must glad for the services I held for him. July 6, 1942, Diary entry by Gihachi, translated from Japanese. Receive report from Yukiko in Santa Anita, and there has been no news from my sister[-in-law] in Salt Lake City, but saw an article about my brother’s death in the Utah Nippo. [According to this] my brother was attending a friend’s funeral and had just spoken and had just returned to his seat when he collapsed and died. 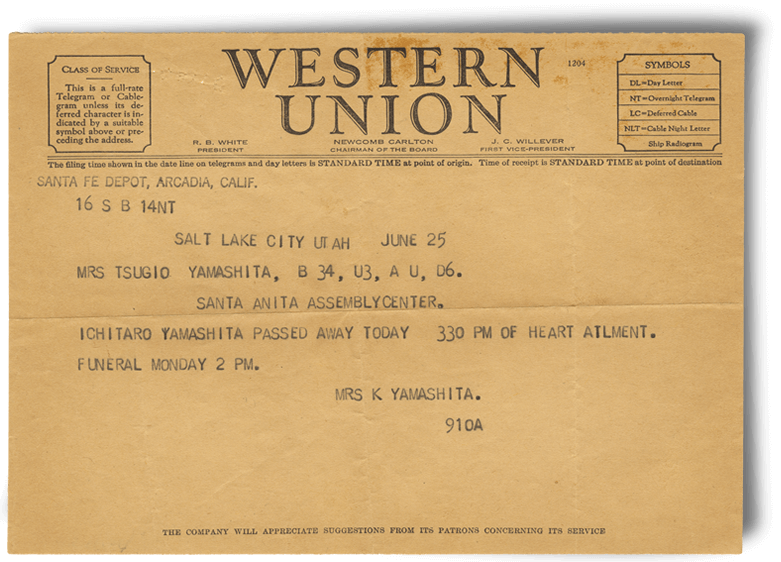 Telegram from sister-in-law informing Tsugio that Gihachi’s brother, Ichitaro, had passed away. 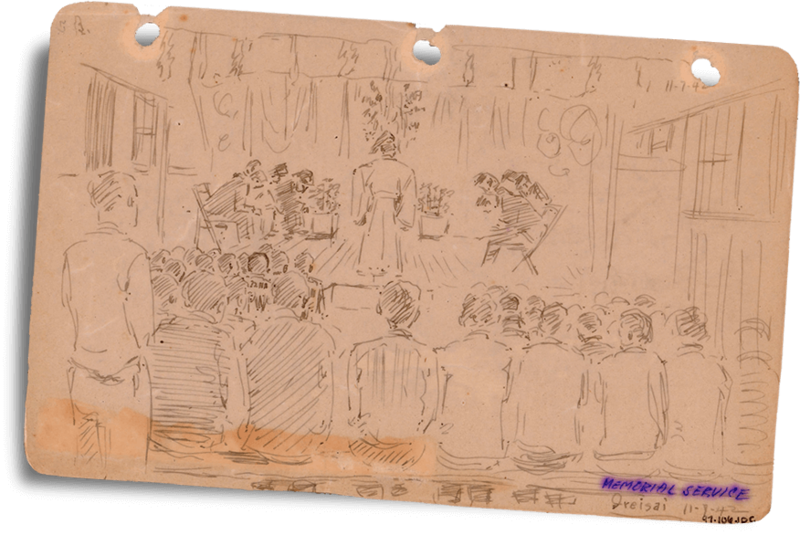 Sketch of memorial service conducted in an internment camp.